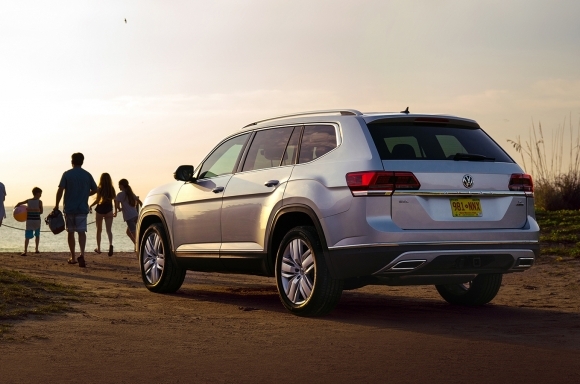 Herndon, VA (April 2, 2019) — Volkswagen of America, Inc. is proud to announce that the Volkswagen Atlas has been named to the Parents Magazine 10 Best Family Cars of 2019 list. Editors at Parents magazine praised the Atlas for its ample legroom and cargo space, even with five car seats or boosters installed. The SUV’s fuel economy and its bumper-to-bumper warranty, covering six-year or 72,000 miles (whichever occurs first) were also highlighted as noteworthy buying points. The Volkswagen Atlas was introduced in Spring 2017 as the brand’s first three-row SUV. Designed specifically for the American family, the 2019 Atlas is available with two engine options—a 2.0-liter, turbocharged four-cylinder and a 3.6-liter V6—and in seven trim levels: S, SE, SE w/ Technology, SE w/Technology R-Line® SEL, SEL R-Line, and SEL Premium. Atlas also offers 4Motion® all-wheel drive on a variety of trims and is assembled in Volkswagen’s state-of-the-art plant in Chattanooga, Tenn. Manufacturer’s Suggested Retail Prices start at $30,895. Atlas, along with the rest of the 2019 Volkswagen family (excluding e-Golf), comes with the People First Warranty, a six-year or 72,000-mile (whichever occurs first) bumper-to-bumper New Vehicle Limited Warranty, which includes powertrain coverage for engines, transmissions and optional 4Motion® all-wheel-drive systems and can be transferred to subsequent owners throughout the remainder of its duration. For more information about the 10 Best Family Cars of 2019 list by Parents magazine, please visit Parents.com/BestCars. Parents magazine helps busy moms raise healthy, happy children. This 90+ year old brand offers trusted content with a familiar voice, empowering today’s parents to make the best decisions for their families while connecting with readers on an emotional level and celebrating moments big and small. Parents reaches more than 12 million readers monthly through an award-winning magazine, and extends to millions of users through digital and social platforms. Parents magazine is the flagship of the Parents Network, which includes FamilyFun and Parents Latina as well as Parents.com, and Parenting.com. Parents magazine is published 12 times a year by Meredith Corporation with a rate base of 2.2 million. “4Motion”, “VW”, “Volkswagen”, all model names and the Volkswagen logo are registered trademarks of Volkswagen AG. All other trademarks are the property of their respective owners. Fuel economy will vary and depends on several factors including driving habits and vehicle condition. See www.fueleconomy.gov for details. 6 years/72,000 miles (whichever occurs first) New Vehicle Limited Warranty on MY2018 and newer VW vehicles, excluding e-Golf. Remainder of warranty coverage transfers to subsequent vehicle owner. See owner’s literature or dealer for warranty exclusions and limitations. Always ensure that the child restraint system is positioned correctly, is securely attached to vehicle, and does not contact any of the safety belt buckles. See owner’s literature for details. All prices listed are the Manufacturer’s Suggested Retail Price and exclude destination, taxes, title, other options and dealer charges. Dealer sets actual price.